Duck Frites is a London street food vendor serving what we believe to be the best gourmet sandwich and hand-cut, triple cooked chips you'll ever taste! We can all agree that the sandwich is among mankind's greatest inventions. "what makes a good sandwich"
We have created a mouthwatering sensation, which is hearty and delicious. Using daily fresh demi-brioche bread brimming with warm pulled confit duck which is beautifully crisp and juicy. Added is a little red wine jus and crunchy lettuce. Choose from three outstanding chutneys which compliment the duck perfectly. Cooked by people who care, made to order, simplicity is the key to this sandwich. 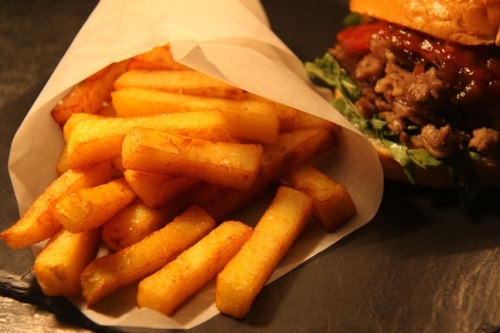 In addition we offer chunky hand-cut, triple cooked chips. Crispy on the outside and fluffy and warm on the inside. Made using Rooster potatoes and cooked in duck fat. A great accompaniment with our duck sandwich or simply irresistible on their own! For Spring / Summer 2018 we have added our favourite duck dishes to the menu. See our menu page to see whats on offer. Duck Frites. All rights reserved, 2018.